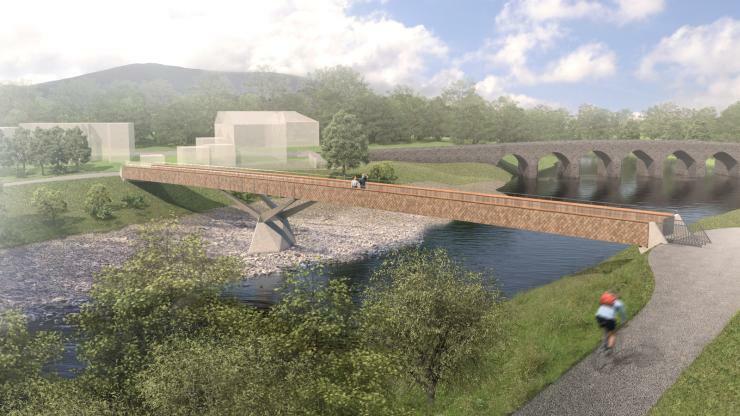 The bridge across the River Usk in South Wales will connect the town of Abergavenny and the village of Llanfoist. The current link is a Grade II* listed highway bridge of medieval origins that is too narrow to provide a comfortable crossing. Knight Architects and WSP, commissioned by Monmouthshire County Council, have designed a quieter and safer route away from the highway. The route crosses the river 100m downstream of the existing bridge. The structure comprises a two-span through beam (25m + 36m) with a timber and stainless-steel deck that has a 3m-wide U-shaped cross section. These side beams also act as parapets and are protected with a geometric timber protective cladding, designed to add architectural interest in close views. An intermediate concrete support pier with four stainless steel arms has combines a sculptural form with a hydrodynamic shape, acting as a cutwater to the significant flood waters that can occur along the Usk Valley. The approach ramps are designed as smooth green embankments, raising the bridge structure above the flood water levels.